Wishing all of you a Merry Christmas and Blessed New Year!!! The Indian Pulav or Pulao is known as Pilaf in English. It is a medley of rice, vegetables and/or meat. 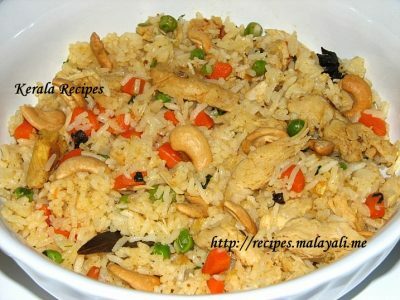 The rice is browned in oil and then mixed with vegetables, egg, chicken , nuts, fruits etc. 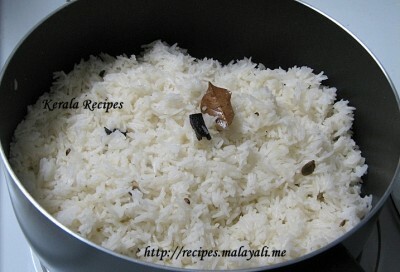 Basmati Rice is generally used for making Pulav. 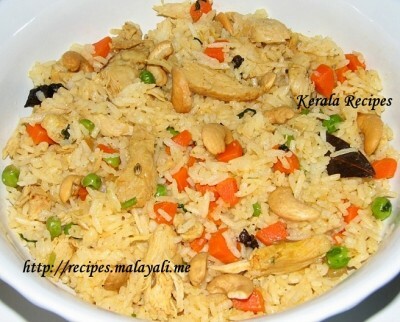 Here is a recipe for an Easy Chicken Pulav. You can use any left over chicken pieces for making this Pulao or you can use any brand of fully cooked Chicken pieces like Perdue. I have used fully cooked shredded Chicken Breasts in this recipe. I made this Chicken Pulav for Christmas as I wanted a change from the usual Biryani and Fried Rice. It tasted great and we had it with Raitha and Pickle. You can also have it with any spicy gravy of your choice. Wash and drain the Basmathi rice thoroughly. Heat a big pan and add 2 tablespoons of oil or ghee. Throw in fennel seeds, cinnamon, bay leaves, cardamom, cloves and star anise. Saute for 2-3 minutes till fragrant. Add the drained Basmathi rice and stir fry for around 5 minutes until it begins to change color. Add 3.5 to 4 cups of water along with a little salt and bring it to a rolling boil. Reduce heat and cover the pan. Cook for around 10 minutes until the rice is cooked and all water has been absorbed. Remove from heat and keep it covered for 5 minutes. Fluff the cooked rice with a fork. You can also spread it out on a tray. Heat a big non stick pan and add 2 tablespoons of oil or ghee. Fry cashews and raisins until the cashews are lightly brown and the raisins become plump. Drain and keep aside. To the same oil, add the onions and saute till they begin to brown. Add the ginger garlic paste and cilantro leaves and saute until the raw smell of ginger garlic paste disappears. Add carrots green peas and saute for few minutes. Cover and cook the veggies until tender. Add the shredded chicken pieces and stir fry for around 5 minutes until lightly brown. Add 1 tsp Biriyani Masala Powder, 2 tsp red chilly powder and salt to taste. Saute for 2 minutes. Reduce heat and add the cooked rice to the pan. Combine everything gently. Sprinkle lemon juice. 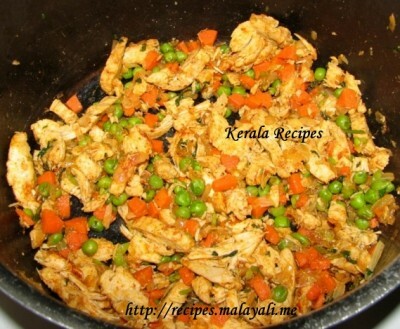 If you are using left over chicken from any dish, then shred the pieces finely before adding it to the Pulav. If you are using raw chicken, then boil the chicken with salt and pepper for around 15 minutes until it is cooked. Drain and remove the bones if any. Shred into small pieces.